When HTC announced the Grip last year, we were underwhelmed by the Taiwanese company’s first fitness foray. In fact, we didn’t even know who the damn thing was for. HTC instead pumped the brakes on the Grip’s release and teamed up with Under Armour. It was a wise decision. I’ve been using the UA Band for Android (though it also works for iOS) with beta software for the last month or so, and HTC and Under Armour get a few things very, very right. One is battery life. HTC says about five days on a single charge, and I agree with that. But the more amazing piece of tech wizardry is that the wearable can pretty much charge from 0 percent to 100 percent in 15 minutes. Seriously, I timed it. The other “yes, yes, very good” thing on the UA Band is an included HR sensor, which was originally left off the Grip. Now, wrist-based HR readings are not as accurate as a good old chest sensor. But for me (hint: I am a writer, not an athlete), being able to check my heart rate throughout the day and also get resting heart rate measurements is incredibly useful and should always be included on a device that’s meant to be for fitness. Third, the app. I won’t pass any final judgements on the UA Record app, which Under Armour has updated to play nice with the UA Band and other new connected devices (one second, I’ll get to those), because I was only using beta software. But, even in its less-than-complete form, the app works great, mainly because it offers differing levels of complexity. Need to file every single calorie you consume? You can do that by connecting to third party apps. Just want a more macro read on your diet based on Light, Medium, or Heavy food consumption? You can do that, too, right on the dashboard. If you’re just too busy for even those few button presses, you can simply chose how you’re feeling on 1-10 scale. It doesn’t get much simpler than that. Lastly, HTC also refined the build quality of the UA Band to make it something you’d want to wear outside of the gym, with a smaller footprint and a strap that’s stupid-simple to put on. The look is definitely more on the boring side with a rubber, matte black finish rimmed with red rubber (which you can barely see when wearing) but it’s more or less unobtrusive and you’ll soon forget it’s even there. The UA Band is also water resistant. I’ve worn the band through many, many showers and the only problem is slight wear and tear on the metal button on the clasp. Other than that, perfection. There’s only one button, which turns the display on and off or get you back to the home screen. A long press will turn the UA Band off altogether. Speaking of that display, it’s just a simple PMOLED, black-and-white display, but it responds with a mere flick left or right. It’s definitely not great to look at—the display blurs a bit as it passes through the plastic casing—but it’s easily readable inside and outside. You’ll cycle through menus like Activity, Sleep, Heart Rate, and Fitness. In the Fitness menu, you can also select a certain activity like cycling or lifting, and you’ll receive even more accurate readings. The band can only store three types of workouts at a time but you can switch out for sports-related activities as well like basketball, baseball, or golf. Of course, the main screen tells the time and you’re only two taps away from controlling music or tweaking settings. Not everything is perfect. The biggest problem I had with the UA Band is that it would sometimes lose connection to my phone, which wouldn’t be immediately apparent. I would check the app dashboard and see almost none of the information from the day. This usually meant taking a quick trip through sync settings. You also can’t take actions on notifications or phone calls—just see them. For me that was perfectly adequate. I’ve never liked trying to communicate extensively with a wearable anyway, but for some it might be a bummer. The display is also pretty low definition compared to Fitbit. 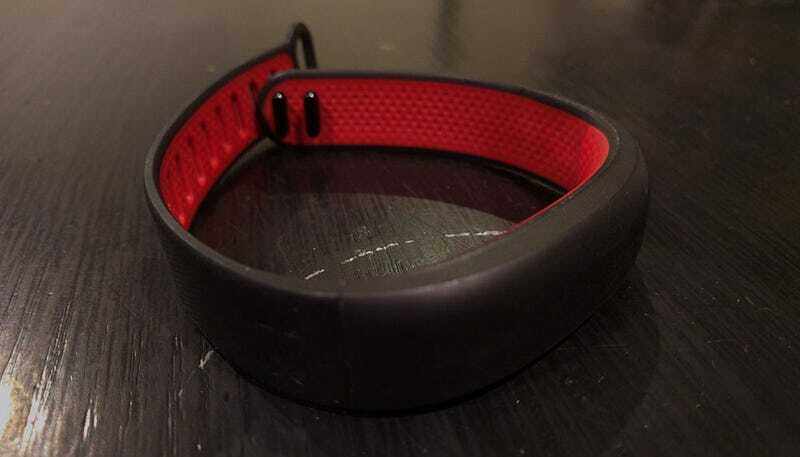 The UA Band is sold separately, but also part of what HTC is calling the Healthbox. This includes the Band, a HR chest sensor, and also a smart scale, designed with the same black-and-red color scheme, that works much like Fitbit’s wifi-connected Aria scale. The scale is able to recognize the user and also syncs information back to the UA Record app. Under Armour even created smart shoes that work with MapMyRun to measure distance and other metrics in the shoe, though that’s not included in Healthbox. Healthbox will run at $400, but the UA Band by itself is $180. That’s a teeny bit expensive since Fitbit’s Charge HR, which is excellent, is only $150 (though it is not showerproof.) It’ll probably just come down to personal preference. Healthbox will be in stores starting January 22.